Greek Default Watch: Time to Let Greece Go? Europe is exhausted with Greece. Greece is exhausted period. It is time to let go? Not quite. The case for letting go is simple. The results of first €110 bn bailout have been mixed. After a strong start in 2010, progress slowed, and 2011 was abysmal. The economy continues to shrink, finances are not improving, unemployment keeps rising, social tensions are mounting and public health is deteriorating. There is no longer a sincere dialogue between Greece and troika. Greece no longer claims any ownership over this program (if it ever did). Politicians have zero credibility to promise, much less implement, reforms. If the Europeans don’t trust the Greeks, and if the Greek government can’t deliver, what’s the point of keeping down this path? A default and even a Eurozone exit would not be the end of the world, although a Eurozone exit carries more contagion risk than a mere debt write-off. So many countries have defaulted and launched new currencies without collapsing. A default would allow the government to offer tax breaks or increase spending to prop up growth. A new currency would make goods and services more competitive, and it would prompt an export boom. Trade may be hampered for a while as finance becomes scare, but it will ultimately be restored. Provided that Europe can contain this exit, Greece would plunge into a deeper crisis but at least it would see a clearer way out. Much of the pain facing Greek society would become deeper for a short period but would be alleviated later on. If that is so, why not just default? Odd as it may seem, default is the easy way out. It alleviates pain but does not correct the underlying problems from which pain emerged. Europe is rightly frustrated that Greek governments cannot seem to implement reform. But this is a supply problem. At the same time, the demand for reforms is changing, and in that sense, first bailout did much good. A default in 2012 is not the same as a default in 2010. If Greece defaulted in 2010, as many economists advocated it should have, the default would have been devastating but not cathartic. Greeks would have blamed various villains such as politicians, domestic and foreign banks, speculators and the European Union. Answers to the question “what went wrong” would have been too broad, and the crisis would have laid no seeds for regeneration. Instead, the national conversation is different today and, in many ways, it favors reform. After a big demonstration at the time when Greece signed the first bailout agreement, public opposition was subdued in 2010. Partly, it was a grace period – any young government gets a break during a major initiative. But more broadly, there were two forces at work. First, the reforms of 2010 were narrow, and it was easy to beat one interest group at a time. Second, there was genuine hope that chronic ills – tax evasion, restrictive regulations and exorbitant benefits in the public sector – would be corrected. Both forces changed in 2011. As the reform agenda widened, the government’s commitment waned and the ruling party hedged its bets. This equivocation alienated the people who consented to pain only as long as it led to meaningful reforms. By mid 2011, the state had pushed for just enough reform to anger those who stood to lose from it but not enough to win over those who stood to gain from it. Now, the state keeps trying to raise taxes to pay for its unwillingness to shrink the public sector, to reform the private sector and to curb tax evasion. And yet the past 18 months have also empowered the reform movement. First, the bailout bred hope. It did for Greece what the Tunisian man who set himself on fire did for Arab world: it broke a psychological barrier and awakened all those who had given up on the prospect of Greece ever changing to regain some; it empowered people and forced them to reengage. For the first time in a generation, the bailout offered an alternative future for all those people who were sick and tired of “old Greece.” Second, the bailout forced Greek society to debate taboos by placing issues such as public sector employment and privatizations at the center of the national dialogue where they could no longer hide. This was welcome but, in certain ways, not enough. There was certainly an ownership issue: Greeks people saw foreigners calling all the shots and were frustrated at their incapacity to impact their future. More broadly, however, the reform advocates were too afraid and politically narrow-minded to argue for reform. And so the debate soon became “memorandum or the drachma” or even, “memorandum or the tanks.” In some ways, these were indeed the dilemmas facing Greece. But they also misrepresented what was going on. Yes, Greece was forced to change certain things at gunpoint. But did we really need bureaucrats from Brussels, Frankfurt and Washington, DC to tell us that collecting taxes is a good thing? That people who should be paid relative to what they do? That we should have honest statistics? That we cannot spend more than we earn with impunity? Did we really foreigners to tell us those things? So where are we now? The overwhelming feeling in the country is one of frustration. That leaves five paths open. One is to allow a massive default and a new drachma – the premise being that only when the country hits rock bottom will it reform. But not everyone who hits bottom recovers, and certainly not quickly – this is risky and may push Greece on the edge and leave it there for a long time. Even though it may turn out to be the only path, it is indeed a last resort option as it would wipe out any short to near-term prospect for a liberal reform agenda to take hold. The other four courses depend on how frustration is mobilized politically. One option is for the country to become apolitical, where people are so frustrated and disillusioned that they disengage. Such an outcome would mean that we have weak governments with limited mandates and where little gets done. Another path is for the country to fall for populism, look inward and blame outsiders. Yet another path is for the country to demand “law and order” and accept a quasi-police state that pledges to restore order and some modicum of decision-making. And a final path is for frustration to generate momentum for a bottom-up restructuring of the country along the lines of a leaner but more efficient state and a bigger and more productive private sector. Europe needs to understand that its investment in Greece has nothing to do with paying back debt. Rather, it’s about to providing an environment where reforms can gain momentum – where that fifth path becomes more likely. Europe is too focused on the supply of reforms (and lack thereof) – it ought to focus on the demand instead. That demand has generally risen over the past 18 months – but it has also reached a wall. Absent any careful nurturing, it will dissipate. And the fallout from that failure will far exceed the economic havoc from a disorderly default and currency re-launch. What Europe needs is to reassure reform minded Greeks that reforms are possible and that any government elected by the people to carry them out will have enormous support in its efforts. Reading your posts gives me the hope that there is a future for Greece. A a citizen of one of the creditor states I demand that my tax-money is spent in a prudent way. And I don't see that just handing over money to the corrupt bunch that rules Greece is spending that money in a prudent way. As a citizen of the EU I want my government to help my fellow citizens in Greece to overcome this horrible crisis. Thank you for that comment. I believe there is enormous and genuine goodwill in the creditor countries to help Greece provided that Greece does it part. Sadly, we have all but squandered that goodwill. At the same time, I hope that the creditors can move past the debate "do we give money to Greece or not" and onto "how do we best encourage reforms in Greece." That's what this post is really about. First things first, europe has to make sure that the Greeks actually want these reforms.. It may sound as common sense but watching the everyday life in Greece doesn't really give me that impression. I know we couldn't choose a worst timing for elections but I see it as the only way to find out whether the Greeks want to move on with these reforms or not. Now, let's assume that the majority of Greeks do want the restructuring of the state.. even in that case things are almost impossible to change in one to three years like the memorandum dictates. We don't even have basic database systems to coordinate and support the necessary changes.. every personal information of every greek citizen be that property status, medical records etc etc is IN PAPER!!! It would take for sure more than 5 years to digitise all that so that it can be useful in any way..
Gataki, I agree that we need to look at the ability to reform as well as the desire to reform (this was a central point of my post http://www.greekdefaultwatch.com/2012/01/why-cant-greece-reform.html). That said, I think that if we made a sincere effort towards change, it would be so much easier for Europe to give us a grace period and be patient as we upgrade our own capacity to change. What is frustrating to them is that (a) the lack of political will and (b) the seeming inability to reflect a genuine popular desire towards change into a political movement. I just read the polls and what’s interesting is the almost 32% undecided, at least that’s what I infer is being said. Is there any data out there that suggests why this significant minority is on the fence? I imagine sizeable proportion of that 32% will end up voting for one of the main parties. They may not want to admit it to pollsters, but politics is still a pretty tribal business here and many will migrate back to their natural home. I just asked my wife, who has never voted anything but PASOK, who she will vote for and she says she has no idea. I suspect however on polling day she'll hold her nose and vote the same way she always does. gataki: There actually are several reasons. Most of them are pretty well covered in recent times, but behind all the economical reasons are also the geopolitical ones. We just don't want a complete chaos to a country, that in some ways can be considered a farthest fortress against Islamic civilization in Europe. @Martin: I'm sure there are, but I was hoping to hear something different than geopolitical too.. I have the impression that the geopolitical strategies of the Europeans where better served even before we entered the EU (and the Eurozone), when diplomacy and strategy where better consealed from the public. That makes me believe that Europe could still have it's way in the area easily even if Greece left the eurozone as far as both dealing with the internal chaos and the geopolitical policies are concerned. The question is still, why put more effort to keep us in the eurozone if they can achieve their goals with or without Greece? I'm suspecting political and extra-euro economic rather than geopolitical reasons.. The great big elephant in the room is April's elections. Just how much of the vote will be siphoned off by the radical right and left, who have sworn to oppose the memorandum? Will Samaras and ND be able to form a government without their support, especially with the likely collapse in PASOK's vote. For me, all votes are off as to the future path of Greece until the answers to these questions are known. One note of optimism. I'm a teacher of English here in Greece and my students are all to aware of the need for change, and rightly angry with those who got us into this mess. Chris, you're right that the elections are the big unknown. That said, I am not sure how much we'll be able to read into the Greek people's desire for reforms given the complete incompetence of the major parties. If you had a true pro-memorandum party that was serious about, then we could really gauge the populace's support for it. But we don't. So it will be hard to know. On your other point, I too derive hope from the fact that a younger generation of Greeks is looking at the mess that their parents created and may want nothing to do with and, as a result, may pick a very different path for the country. I think we need to be patient - although granted time is not on our side. The generation now in their thirties are largely those who have studied, worked, or otherwise travelled abroad, and are thus more open to a new way of doing things. We should also not lose the fact that a great deal has already been achieved. More in fact than I ever imagined possible in Greece in such a short time. I think it's all about "trust". Sorry to say, but lots of people don't trust the government/state in Grecce. Is like a alcoholic talking about to be sober, you trust him the first times but...he's always screw up. Always talking "next time...". STOP ! It doesn't work ! I think the hard way, massive default (more or less), is the only option left. It's going to be a ugly trip for all participants but that is the only way that really works now. The question is, will Greece be the only land making a default ? I have read the latest memorandum agreement including all reform goals and spending cuts. And I can tell you one thing: Fulfilling all goals is as possible as meeting Elvis Presley on Mars. The calculations do not even include the additional costs for the lay offs of public servants (for unemployment money, settlements etc.). Privatization and other revenue forecasts seem to be too optimistic. That's the bad news. The good news for Greece are that the Troika and finance ministers must know that. Even the latest idea to decide about a big part of the bailout package after the elections seems to be off the table. So it looks like the finance ministers keep on supporting Greece further. "Europe is too focused on the supply of reforms (and lack thereof) – it ought to focus on the demand instead." I think this is a very intelligent sentence! Do you have suggestions how Europeans could do that? But will work to develop this further. Although I generally agree with the conclusion of this article, there is still a very “old Greek” tone. One of the more problematic issues of the “old Greek” mentality is the “navel of the universe” complex - a presumption that we are somehow central to the existence of others, or worse that the foreigners owe us Greeks. In the last couple of years Europe has succeeded in bailing out their banking systems from heavy exposure to Greece – insulating themselves. If there was an element of good will to help Greece as well, our behaviour has burnt this and blackened our name. The buzz words have gone from “liquidity support” to “amputate & cauterize”. Who can blame them? Why should anyone, anywhere care about us or try and help us – when we ourselves don’t take action to put our own house in order? "let that damn country get lost"??? auto katalabes esu na leei to keimeno? mipws diabases mono ton titlo? gia dokimase ksana pio prosektika..
You are absolutely correct in saying that the only sustainable reforms are those that are embraced by the political leadership and supported domestically. That's the bottom line from years of experience in a major bilateral donor agency. It's encouraging that a segment of Greek society understands this; it's unfortunate as I've mentioned previously that reforms have become associated with the harsh medicine of austerity. I agree with your conclusion, we can only hope the EU understands this too. However, I disagree with the five possible roads. The alternative is crystal clear, populism and isolation. It's blatantly obvious that this is where the propaganda from a good part of the political elite and mass media is leading - and it's also well suited to the anachronistic, xenophobic tendencies of the average Greek. Unfortunatelly our society has not yet recovered from the trauma of the German occupation, subsequent civil war, and dictatorship. Not to mention than in times of crisis or revolution nobody is inclined to listen to reason - instead, the only forces capable of gathering momentum and influence the masses are populists and radicals. This is just a historical fact. If any reforms are to be implemented they will have to be forced from the top down, and hope the people will be convinced when they reap the benefits. People here are rebelling against our government primarily because there is a sense of *injustice* in the Greek society.And with good reason-Greeks are furious that they have to pay property taxes when the government does nothing to arrest those who owe to the state.There is little if any question as to whether the people are concerned over a potential advent of a "4th Reich". there was an interesting interview with Schaeuble in a newspaper today. He is claiming that Greek politicians haven't accepted any help which has been offered to them. He says that Greek has been offered technical assistance to build up a functioning tax system since a year. The construction of a business development bank is not proceeding fast enough either even though help was offered etc. In another interview, Germany's Secretary of Commerce says something similar. He claims that Greece has not accepted a single offer to get help to conduct growth enhancing reforms since his last visit to Athens a view months ago. He said "unfortunatelly, reforms do not have a high priority in Greece. But without growth, Greece's economy won't make it." In the Financial Times Germany, the American economist Melvyn Krauss claims that it is impossible for Greece to stay in the EZ because "the trust of its European partners in Greece is Greece's most important asset at the moment. And this trust is not down, it is several meters under the ground." 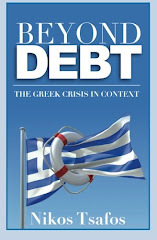 (free translation) On the other hand, he and many economists see huge development and growth potentials in Greece. What a sad story! My fellow Greeks, do Greek newspapers also report about such opinions? Or are your newpapers entirely in the hands of your political caste? Indeed, it could be worth while to examine more closely what has happened to the list of tax evaders that was published recently in Greece. Originally, if I remember correctly, the amount of outstanding taxes had been given as 40 billion euros. That was for the "long" list, only a "short" list (with 6000 names) of the biggest offenders was published; but even for the short list, the amount of unpaid taxes is said to be 15 billion. Now I have read that the Greek authorities expect to recover between 1 and 3 billion - the figures vary, but it is just a small fraction of the overall amount. How is such a thing possible? Were the Greek tax authorities unable (or unwilling?) to draw up a correct list, even in two years after the beginning of the crisis? Or do we have to assume that the list is correct, but there is no will to collect taxes from the rich? Are the fiscal authorities corrupt to that point? Why is there no bigger outcry in Greece against people who owe the Greek state many millions? Their names are known now. (I have read that at least some individuals have been taken to prison now, but they seemed to be few isolated cases.) According to the interview that is mentioned above, help that was offered by the German ministry of finance for a more efficient collection of taxes was not accepted. Why not?